If you’re looking for a good indoor tanning bronzer, let me just say the Tan Asz U LUAU 200X Island Black Bronzer is the way to go. The Tan Asz U brand is known for their attractive and effervescent bottle designs, so its no surprise the Luau is just as striking. I like that they have encapsulated the luau theme in their design with using tropical flowers and colors. The design has a white backdrop that fuses into an aqua blue expanse towards the base of the bottle with vibrant fuchsia hibiscus flowers on both sides and above the Luau label, which are both nestled beside a blue palm tree, it’s really lovely. 200X Island Black Bronzing evokes paradise-level dark color. Marula Goddess Glow Serum utilizes high levels of Marula Oil for incredible skin. An island extracts & max silicone cocktail conditions skin for a lasting softness and glow. One of the first things I did when I came across this bronzer was to uncork and take a quick whiff, and the aroma was pretty nice – but even nicer when I applied it. I was actually on my way to the tanning salon when I scooped up a bottle for the first time and the minute I smeared the lotion on my hands and shoulders the tropical fruity scent hit me even stronger. However I, can’t seem to distinguish the essences used but I will say that I identified hints of pineapple and peaches that is partly mentioned in the product description; it says the fragrance is awapuhi peach smoothie along with island extracts. The lotion is of medium consistency and a bit oily which made it rub in effortlessly, providing adequate coverage quickly, you can see how it spreads over your skin too because the advanced bronzing components give it a brown color. 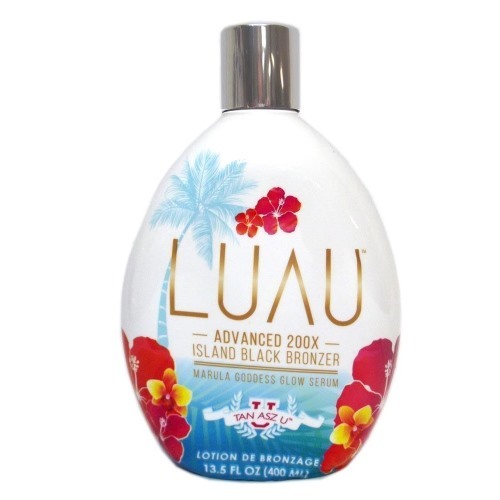 Choosing tanning lotions with the right consistency will help to eliminate streaking and uneven shades on your body, so this Tan Asz U LUAU 200X Island Black Bronzer was a good choice since I had no streaking or uneven skin tone when I was done tanning. Plus, it left my skin feeling conditioned and soft as well as looking healthy. After just one session I saw noticeable results and I like the tint this bronzer gave my skin, it didn’t look orangey and even after showering it left my skin looking naturally brown and tanned. Of course, my palms got messy after applying it to my body but I usually take wet wipes to remove excess bronzer so that I don’t go into the tanning bed with it. Also, after tanning, you can use a washcloth with dishwashing liquid to remove the remainder; I find this works more effectively than regular bath soaps. This process took everything right off, so I didn’t experience any staining. However, this bronzer is DHA free and dihydroxyacetone (DHA) is the component responsible for staining the skin. DHA is an additive chiefly used in self-bronzers and sunless tanning products, as it reacts with the proteins in the top layer of your skin to essentially cause temporary darkening of your complexion. Bronzers are acquiring more popularity these days; they are specifically made to simulate brown and natural looking skin in a shorter period of time, with minimal exposure to sunlight and overall less stress. You don’t have to depend on the weather or pre-plan a beach or pool day to get a vibrant tan going. Like the Tan Asz U LUAU 200X Island Black Bronzer, they don’t usually contain much sunscreen or SPF protection but instead, include ingredients to protect you from artificial UV rays that tanning beds and lamp exposes you to. The Luau isn’t an artificial bronzer either; like instant bronzers, for example, that is sprayed on will wash off easily, but this bronzer is considered a natural bronzer that uses ingredients to increase your melanin production thus making it water resistant to a considerably good extent, which means you don’t have to worry about losing your tan when taking a shower. A word of advice, for those of you who experience poor results when using tanning lotions and bronzers, is it’s always a good idea to moisturize your skin as a daily regimen and more specifically before and after tanning. This will help to hydrate your skin, prevent dryness and itchiness from occurring as well as replace the vital nutrients lost in the tanning process. If you are a rookie tanner or have very pale skin, try using a basic tanning accelerator first to establish a base tan and allow your body time to adjust to the bronzing process. These measures will also help in preserving your tan. The makers of the Tan Asz U LUAU 200X Island Black Bronzer seemed to have made a lot of effort infusing hydrating elements into this product. It contains marula oil to influence silky and conditioned skin and has a silicone base that not only allows for easy application but will also leave your skin glowing and feeling soft. Implementing these elements are particularly important to the tanning process, as there is no denying that tanning resulting from any medium is harmful to your skin. I found this bronzer to be quite effective since it facilitated my needs in what I look for in a natural bronzer, i.e. an enhanced brown skin tone with no streaking and lasting results which reduces my exposure to UV radiation. The perks are, it doubles as an incredibly good moisturizer and smells terrific even after tanning. Not that I expect this from tanning lotions really, but it would have gotten a 10 out of 10 from me if it had some type of tattoo protection, which ultimately you get from brands with high ranging SPF, for this reason, I gave it 9 out of 10.